Emirati Grandmaster Saleh A.R. Salem (left) won the Asian Continental Chess Championships 2015 that took place from August 2-10, 2015 at the Hilton Hotel in Al Ain, UAE. 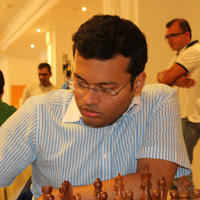 He ensured his crown with a last round draw with GM Vidit Santosh Gujrathi of India. Salem, who was seeded 11th at the start of the 32-nation tournament, had beaten IM S. Nitin of India, drew with Xu Yinglun of China, beat IM Asyl Abdyjapar of Kyrgyzstan, lost to IM Lin Chen of China, won four straight rounds against Liu Chang of China, Indian GM Vishnu Prasanna and national champion S.P. Sethuraman and second seed Nguyen Ngoc Truong Son of Vietnam before his last round draw with Gujrathi. Indian GM Surya Shekhar Ganguly (left) beat GM Zhang Zhong of Singapore in the final round to win the silver medal. Ganguly, 32, tied Salem at 7 points each but the Emirati GM had a better tie-break score with more wins than the Indian GM. It was a good day for Indian men as GM S.P. Sethuraman won the bronze medal. The Indian national champion prevailed in the tie-break as he finished with 6.5 points together with Gujrathi and GM Zhou Jianchao of China. They share the bulk of the $50,000 prize for the men. The top five qualify to the World Cup next month in Baku, Azerbaijan. Salem had already pre-qualified from last year`s Asian Continental while Sethuraman had qualified from the Indian Zonal. Thus their slots went to the two players next in line, untitled 15-year-old Maghsoodloo Parham of Iran and GM Lalith Babu of India, who finished in an 8-way tie with 6 points each but had the better tie break with more wins. 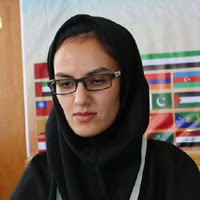 WIM Mitra Hejazipour (left) of Iran won the gold medal in the women`s division and the right to represent Asia in the Women`s World Chess Championship. Hejazipour used the Sicilian defense Najdorf variation to beat Indian WGM Mary Ann Gomes in 39 moves. 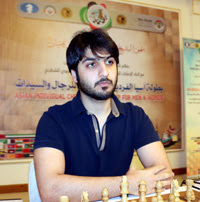 The Iranian tallied 7 points in a tie with IM Shen Yang of China but with better tie break of 7 wins against 5 wins of the Chinese silver medalist. It was a bad day for the Indian women as Shen Yang crushed the King`s Indian defense of Vijayalakshmi Subbaraman in 47 moves. The Indian WGM had to satisfy herself with the bronze medal after leading in the homestretch. Tied at 6.5 points each are WIM Pratyusah Bodda of India and WGM Dinara Saduakassova of Kazakhstan for a share of the $25,000 in total prize money for the women. 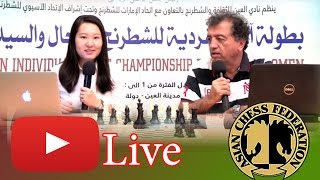 Live running commentary by GM Tahir Vakhidov and WGM Zhang Jilin is watched worldwide on Youtube. The event is organized by the Asian Chess Federation in cooperation with the Abu Dhabi Sports Council and UAE Chess Federation. The Asian Rapid Chess championship and Blitz chess championship follow the main event with a total of $12,000 in cash prizes.